Three injured in London underground "terrorist incident"
Sky News reports that the man shouted “This is for Syria” before stabbing the commuter. A still from the video obtained by Sky News. A MAN WIELDING a large knife has been arrested in London after allegedly stabbing a commuter on the city’s underground. 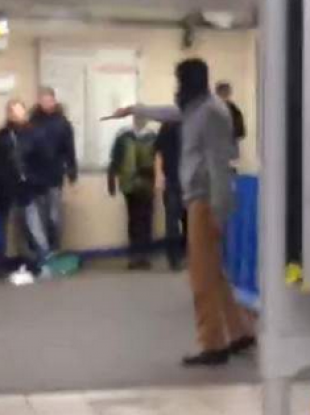 A man shown in a video obtained by Sky News wielding a large knife was tasered before being arrested, Met Police said. Another bystander heard in the video shouts “You ain’t no Muslim, bruv”. A Scotland Yard spokesperson said that police were called at around 7pm today to a report of a stabbing at Leytonstone underground station. One victim sustained a stab wound to the neck, while two others were injured. We are treating this as a terrorist incident. I would urge the public to remain calm, but alert and vigilant. The threat from terrorism remains at severe, which means that a terrorist attack is highly likely. “I would appeal to anyone who was in the vicinity of Leytonstone underground station earlier this evening at around 7pm who saw anything suspicious to call the Anti-Terrorist Hotline on 0800 789 321. Email “Three injured in London underground "terrorist incident"”. Feedback on “Three injured in London underground "terrorist incident"”.